California Governor Jerry Brown almost predictably blamed human-caused, carbon dioxide-fueled global warming and climate change, specifically droughts, as the cause of these conflagrations. During a December 9 visit to Ventura County, he again insisted that the drought conditions were the “new normal.” While acknowledging that California has experienced “very long droughts” throughout its history, he claimed that the returning dry spells of recent decades were “very bad” and would be “returning more often” because of manmade climate change. It’s a nice attempt to deflect blame from his state’s ultra-green policies and poor forest management practices. Moreover, Governor Brown is just wrong about the alleged role of manmade climate change, as an examination of meteorological and climate data demonstrates. NOAA’s rainfall records for California show rainfall slightly increasing in California over the 125-year period since rainfall records began. Meteorological conditions, as they develop over the course of a year, and during the multi-year El-Niño to La Niña cycles known as ENSO (El Niño Southern Oscillation), result in conditions that favor wildfires in California. Fire is a part of nature, much to the consternation of those who blame manmade climate change, and much to the dismay of those whose lives are disrupted by wildfire events such as these. Of course, they can be – and are – worsened and even made catastrophic by failures to manage forests properly, especially when hundreds of homes are built near forests, and when weather and climate cycles intersect with those failures and incidents that start a wildfire. In the United States, the “Sun Belt” from California to Florida receives that name because a feature of global circulation causes descending air about 30 degrees north and south of the equator. At the surface, this “Hadley cell” is evident in high pressure monthly and annual means (or averages); it’s also called the subtropical high and subtropical ridge. In the northern hemisphere, the position and strength of the subtropical ridge changes over the course of the year, getting stronger and moving further north in the summertime. In California that poleward migration of the subtropical ridge diverts rain-producing storm systems poleward to the north, resulting in an almost complete loss of rainfall in the summer. The annual Los Angeles climatology illustrated in Figure 1 helps tell the story of the California wildfire season. With this information, if we think critically, the usual situation is for vegetation to sprout in wet winter months, grow – and then dry out because of the lack of summer rainfall, causing vegetation to be driest in late summer and early fall. this season, right when you’re starting to anticipate some rain, it’s actually the most fire prone part of the year.” Power line and other management failures increase the likelihood of disaster. Yet another factor is the failure or refusal of government agencies to permit the removal of dead, diseased and desiccated trees and brush from these woodlands – especially in the broad vicinity of these communities. In fact, California forests have 129 million dead trees, according to the US Forest Service. Together, these factors all but ensure recurrent conflagrations and tragic losses of property and lives. As autumn sets in, the first cold frontal passages and cold air masses build into Nevada and adjacent states, and a northeasterly pressure gradient develops over California. Because of atmospheric physics, a process called adiabatic compression causes hot, dry winds to develop, often quickly and dramatically. There was a significant cooling of Pacific Ocean temperatures from the peak of the 2015-16 El Niño to December 2017, such that La Niña conditions have developed in recent months. 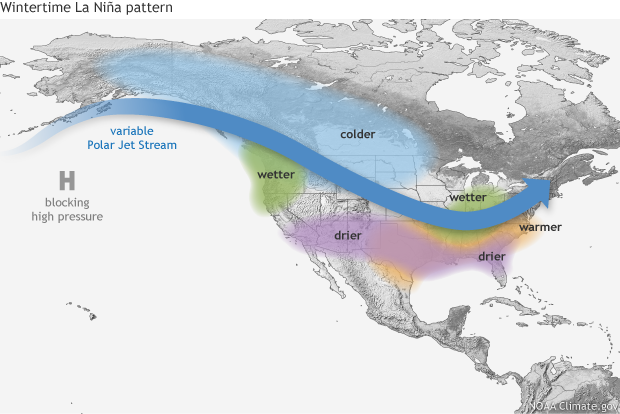 This distinct pattern shift brought distinctly drier conditions from southern California and Arizona to Florida and South Carolina. This pattern shift is part of the evolution of temperature and precipitation change areas characteristic of the ENSO sequence of events. Contrary to Governor Brown’s politically inspired assertions, it clearly is not the result of human-caused, CO2-fueled global warming. This brings us to the devastating Thomas Fire, which began on the evening of 4 December 2017, and was not completely contained by New Year’s Eve, 31 December. Behavior of this fire was controlled by a large-in-extent and long-in-duration Santa Ana Wind event, and like the previous Wine Country Fire, was dominated by high pressure over Nevada and persistent hot, dry, strong down-slope winds that commonly occur during such meteorological conditions. In short, it is meteorological conditions which create the environment for the spread of such fires. This year’s changeover from wet El Niño to dry La Niña conditions played a significant part in the atmospheric set-up for the 2017 fires. In Australia, it is widely accepted that fuel reduction actions are an accepted practice in fire management. This is not the case in the USA, where considerable debate still rages over the issue, and where environmentalists, politicians, regulators and courts have united to block tree thinning, brush removal and harvesting of dead and dying trees. The resulting conditions are perfect for devastating wildfires, which denude hillsides and forest habitats, leaving barren soils that cannot absorb the heavy rains that frequently follow the fires – leading to equally devastating, equally deadly mudslides. In fact, environmental regulations associated with ill-fated attempts to help the spotted owl have eliminated logging and clearing throughout California and most of the Mountain West – with catastrophic results. Special legislation has been drafted to begin to address this problem. However, it is uncertain whether the legislation will be enacted and whether timber harvesting and/or fuel reduction strategies can be implemented in time to address the fuel excesses that exacerbate these dangerous conditions, setting the stage for yet another round of infernos and mudslides that wipe out wildlife habitats, destroy homes and communities, and leave hundreds of people dead, injured or burned horribly. When will the responsible parties be held accountable, and compelled to change their ways? Figure 1: Climatology of Los Angeles, California, from this tracking website. The green bars show the monthly rainfall which peaks in winter and falls off dramatically as the subtropical ridge strengthens and moves poleward. On average there is almost no rainfall in the summer months because rain-producing storms are shunted to the north.